This section is for those who want to do a devotional focused Advent, without the activities, crafts, and other items listed. Light the candle as given, read the Bible verse listed, and pray together. For printable pages, go to Advent Fun Pages. Dear Lord, as we begin this period of Advent, let us be ever thankful for abundance and joyful in the hope of your coming birth. We look forward with longing to the fulfillment of God’s promise that the Messiah would come and redeem us. May our thoughts and actions in this season and all year be pleasing to you. Amen. Lord, let our thoughts and deeds today reflect your love, generosity and grace. We pray that you will grow the spirit of Christmas within us and spread your light to those around us. Amen. Lord, we look forward to the celebration of your birthday, as we also look forward to your triumphant return when the trumpets will sound. We give ourselves fully to you today. In Jesus’ name, Amen. Oh, Lord, let us feel the light of your presence now as we gather around this wreath of lights. As we light these two candles, may this time together help us to prepare our hearts for the wonder of your birth. 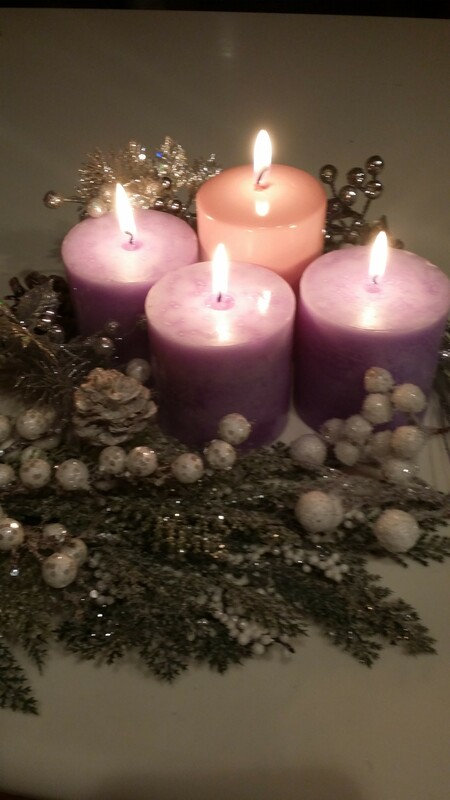 Let the lighting of each candle along this journey of Advent remind us of the hope, joy and love the world cannot provide for us; the true source of these can only be you. Grow gratitude and compassion in our hearts this month and always. In His name we pray, Amen. Father, open our eyes to those in need around us. Open our hearts to those who are suffering and cannot see the light of your love. Amen. Read Luke 2:22-35 and Luke 2:39-40. Lord, shield us from giving out of obligation, and help us to give generously to others, from our hearts. Teach us to excel in this grace of giving of our time and attention. Lead us to cross paths with those who need us. In His precious name, Amen. Father, you have showered us with blessings. We are thankful, Lord, for all your blessings small and great. We are truly thankful for your sacrifice. Amen. Dear God, we are thankful that we can worship you now and we look forward with longing to the gift of your son. Amen. O God of our heart, we thank you for this day. As we see the flame of the candles before us, we are grateful for all of the people who bring light into our lives. Help us to be a true blessing to family and friends. Open our eyes to the tiny blessings that are all around us. In His name, Amen. Oh, Lord, let us feel your presence now as we gather around this wreath of lights. As we light these candles, let us feel joy with hopeful anticipation of the birth of your truth and love into the world. Let the lighting of each candle this week light a flame of joy in our hearts. Grow the gratitude, love and compassion in our hearts this month and always. Amen. 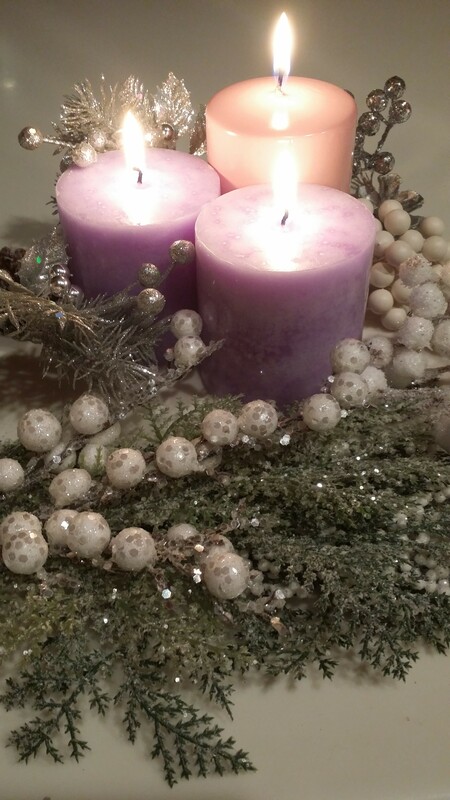 Light two purple candles: the candle of Hope, and the candle of Preparation. Light the candle of Joy, the pink candle. Lord, we have so many things to worry about today in preparation for visitors, gifts, and Christmas day. Let us turn our worries into prayer today and simply rejoice (Phil 4:4-7). We know you hear our prayers, Father, every one. Amen. Father in heaven, we rejoice in you. Our joy comes not from our circumstances but in knowing you are with us always. Lord, help us to focus our minds on praiseworthy things. Amen. Father, we feel your presence here with us now. Apart from you, there is no goodness and joy. We are truly thankful you came to the earth to save us. In your name we pray, Amen. Lord, we are thankful for the blessings you have given us. We know we are owed nothing, and we deserve nothing. It is by your grace that we were born into this life of abundance. Let us have compassion for those who were born into lesser circumstances than our own. Yet we know the true source of our bounty and wonder at all we have been given. We are truly blessed. Amen. Oh comforting Savior, reveal those around us who are lonely, in pain and in need of our attention and love. Provide the healing and courage they may need at this difficult time of year. Help us to reach out to those in love who live alone or have suffered a recent loss. Amen. Father in heaven, let us not become self-absorbed with the details of decorating, grocery and gift shopping, and Christmas cards. Help us to look beyond our own concerns and remember the deeper reason for lighting these special candles. Bring us beyond the daily frustrations and fill our hearts with the true joy that can only come from You, our perfect Savior. Let us carry your light and love to others, even in the small moments of the day. Amen. Read Psalm 5:10-12, Psalm 28:6-8, Psalm 90:13-15. Father in heaven, we thank you for your love. Today, let us carry a sense of how much you love us to give us such a gift as this beautiful day. Let the awareness of your love encourage us to be more reverent in the tasks and thoughts of the day. Your glory fills our spirits. In your precious name, Amen. 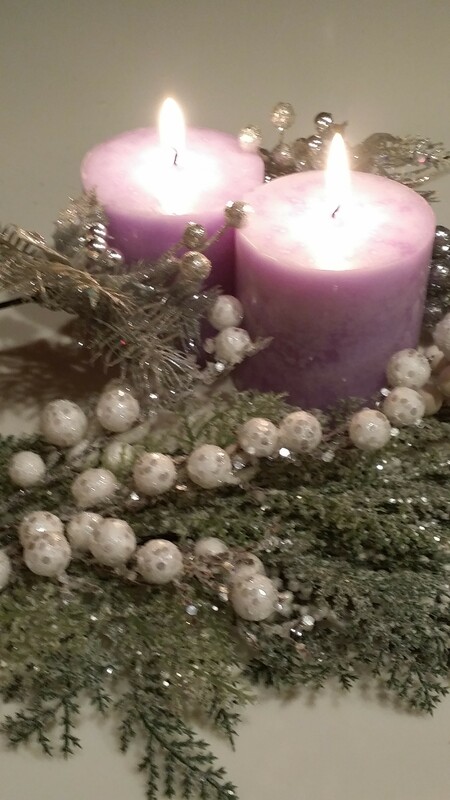 Oh, Lord, let us feel the light of your presence now as we begin this final week of our Advent journey. As we light these candles, fill our hearts with gratitude for our blessings and love for our fellow men. Lord, we thank you for these quiet moments of reflection we have shared together. Always in your grace, Amen. Light two purple candles: the candle of Hope, and the candle of Preparation. Light the candle of Joy, the pink candle. 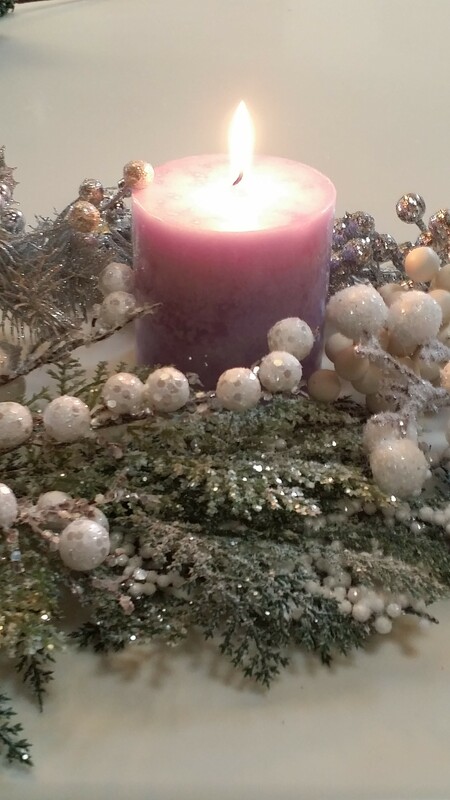 Light the candle of Love, a purple candle. Read 1 Corinthians 13:1-13, Luke 6:27-38. Let us reflect on the story of Jesus’ birth in a new way. He was born into a feed trough and poverty. He was hunted and scorned by the powerful rulers of the time. He grew up in obscurity. Yet He did not shun our imperfect world. He embraced our world and still desires to embrace us today. Father, help us draw closer to you as we wait and hope for your triumphant return. In Jesus’ name we pray, Amen. The Bible tells us that you said “I am the light of the world.” Let our thoughts and actions reflect the peace and love of Jesus this day. Bring His light into our home today and every day. Amen. Lord, please guide us as we share our moments with those family and visitors who may be difficult for us to be with. Let these Advent prayers soften our hearts and allow us to better tolerate the differences we have. Transform our usual responses so we may let others see our faith and be touched by it. Let there be peace and joy in our home for all who enter. In your blessed name, Amen. Lord, please watch over our children. Grow their faith in you. Help them to focus on the right things this season despite all the secular activities going on around Christmas. Please put gratitude in their hearts for the gifts they receive. We ask this with faith and trust in you. Amen. Lord, show us the way to shine your bright light of hope and grace to those we meet each day. Let us be a shining example of Christian love to our family and friends. Let your grace touch those we love and strangers alike. In your precious name we pray, Amen. Today we will put aside our selfish wants to celebrate the most giving and selfless person that ever existed. Please help us, Lord, to mold our hearts to be more like You, our perfect Savior. Amen. Oh, Lord, let us feel the light of your presence now as we gather around this wreath of lights. As we light these candles, let us feel joy and hopeful anticipation of your birth so close at hand. Let the lighting of each of these four candles multiply the joy in our hearts. In your blessed name we pray, Amen. Light two purple candles: the candle of Hope, and the candle of Preparation. Light the candle of Joy, the pink candle. 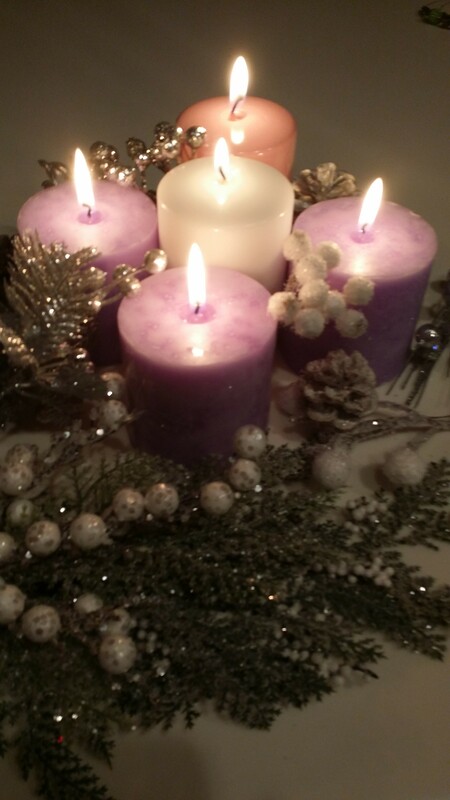 Light the candle of Love, a purple candle. Light the white candle, the Christ candle. Dear Lord, we are so thankful for the many ways you have blessed us with abundance in our lives. Please bless this food and those families around the world who will not have enough to eat today. In gratitude we remember your humble birth in a lowly stable, and pray for those who have no shelter. Lord, help us to be mindful always of your message of love, peace, and sacrifice for others. Even though Advent is over, please keep your loving Spirit alive in our hearts. In His precious name we pray, Amen.